Graham Wynd is just out with the crime noir novella Extricate from Fox Spirit Books. I asked the author behind the author, K. A. Laity, a few questions about the book and noir. K. A. Laity is the award-winning author of several novels as well as editor of the anthologies Weird Noir and Noir Carnival. With cartoonist Elena Steier she created the occult detective comic Jane Quiet. Her bibliography is crammed with short stories, humor pieces, plays and essays, both scholarly and popular. She teaches medieval literature, film, gender studies, New Media and popular culture at the College of Saint Rose. It’s difficult to describe Kate. I know her a tiny little from Twitter and as part of Fox Spirit skulk. She has a foot in Finland and knows and writes about viking history and Hávamál. That scores several points at me. But in general, she is one of those awesome persons that you don’t know if you should run away screaming from, or stay muttering and blushing in respect. Or on the other side maybe even roll on the ground laughing because of all the fun, or give a hug because she says something that moves you. She’s full of energy and creativity, has an impressive bibliography, and seems to be bubbling with new ideas. But she’s kind and always have time to give a writing advice. She’s writing under several names and I must confess I was utterly confused how to present her here. But she’s been kind and has answered a few of my questions. So over to her. Him. Like my favorite noir stories, Extricate is about people who don’t see the options and make bad choices. Desire short circuits careful consideration: when your desire for something outweighs any sensible decisions. In this novella, Peter falls for Judy the instant he lights her cigarette, but she’s his best mate’s girl — and he’s already married. He decides to begin removing obstacles — starting with his wife. How far will he be willing to go? I’ve been reading a lot of classic noir—Dorothy B. Hughes, Patricia Highsmith, James M. Cain, Hammett and Chandler. I wanted to write stories that explored that kind of setting, looking at the ways people let the emotions get the better of them and how obsession builds. Obsessions are often inexplicable to outsiders. I wanted to show how people disappear into the darkness. What is your relationship to the crime genre and noir literature? It’s something I’ve loved for years and years. I got obsessed with Chandler when I was living in Los Angeles in the 80s, which led me to Hammett, too. I love noir films, too, but books have always been my first love. I write crime rather than mysteries because you have to be much more organized to write mysteries—the good ones tie everything together satisfactorily. That’s a lot of work. Much easier to make things fall apart! Could you tell a little about your writing and other books? Under my given name I’ve written mostly speculative fiction, though I have a sort of supernatural noir coming out in April as K. A. Laity, also from Fox Spirit, called White Rabbit. I always found it hard to answer the ‘what do you write?’ question. I have genre specific alter egos now to label books that fit into specific genres, like Graham Wynd for crime, Kit Marlowe for historical adventure and romance, and C. Margery Kempe for the saucy tales. I write fiction and non-fiction, for specialist audiences but also for general readers. As a medievalist, I have to introduce a lot of esoteric stuff to students: finding ways to make complex history from long ago accessible is a great practice. You write under different names. Could you tell a little about that? How does this affect your writing? Do you have different voices, styles? Absolutely! On the one hand, I write ‘too much’ — that’s not my assessment, but one I’ve heard from other people. It helps to spread the publications out amongst my other names, but making them genre-specific helps, too. They all have ongoing projects which helps organize my writing time. I’m blissfully enjoying my sabbatical year by writing like mad. I’ve actually thought about writing the same story for two different pseudonyms, just to see how different I can make them turn out. That’s how my mind works. If you were to give aspiring writers any advice. What would that be? To spoof a line from Mamet, ‘Always be writing.’ We can often become too precious about the process of writing. Make it as natural as breathing and almost as frequent. You know you’re a writer when something awful is happening to you and you realize you’re already describing in your head, choosing the words. Because I was one of those people who for years wrote things and put them in a drawer, I also always encourage people to write things, finish them and submit them somewhere, and start something else—Ray Bradbury’s advice. Always be writing, but don’t keep it to yourself. Learn from rejection, whether it’s to submit somewhere else that’s a better fit, to improve your writing or just to persist. Thank you, Kate. Wish you the best on your writing and getting the words out there. If you want to learn more about K. A. Laity, visit her page here. 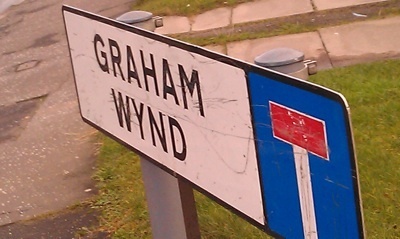 Read more about Graham Wynd here. Read more about Extricate on Fox Spirit Books’ webpage here. Thanks for quizzing me 🙂 but what could possibly make anyone run from me?! I’m so quiet and genteel. Lol. Because you’re so amazing. It’s a compliment! No worries! It makes me laugh. Great to meet the author behind the pseudonym! And to learn more about K.A. and her writing.